Iraq continues to reinvigorate its economy by rebuilding its energy industry. Further work is needed, however, to improve the infrastructure for producing and transporting oil and gas. Oil export revenues account for more than 70% of Iraq’s gross domestic product, according to the International Energy Agency. A lack of reliable power supplies for households and local businesses continues to hinder the social and economic progress of the country. Shell is a major investor in the Iraqi energy industry. In May 2013, the Basrah Gas Company (BGC) began operations. BGC is a joint venture between South Gas Company (51%), Shell (44%) and Mitsubishi (5%). It is the largest gas project in Iraq’s history and the world’s biggest flaring reduction project. BGC aims to capture associated gas that is currently being flared from three oil fields in southern Iraq – Rumaila, West Qurna 1 and Zubair – for use in the domestic market. The Shell-operated Majnoon project produces oil from one of the largest oil fields in the world, estimated by the Iraqi government to hold around 38 billion barrels of oil equivalent (boe). By the end of 2013, Majnoon was producing more than its initial production target of 175,000 boe a day. We have a 45% interest in Majnoon, partnering with Petronas and the Iraqi state, through Missan Oil. Our work involves the clearing of unexploded munitions, which remain from the Iran-Iraq war in the 1980s. Our bomb disposal experts comb sections of the oil field, following safety procedures, by sifting through the sand inch by inch to locate and clear unexploded munitions. To date, we have collected or destroyed over 14,000 unexploded materials from across 54 km2 at the Majnoon oil field. Unemployment is a major challenge for Iraq, particularly among young adults. Where possible, we seek to hire Iraqi people and to use local suppliers: BGC has awarded 23% of its total contracts value to Iraqi companies and around 5,000 Iraqi employees have been seconded from the South Gas Company into BGC. In 2013, we continued to create jobs and build skills among communities near our operations. Around 2,500 local residents worked on the Majnoon project in southern Iraq in jobs that include well engineers, safety advisers and driver trainers. During the year, Shell also set up an internationally accredited course to train local people as well engineers, with more than 20 successfully qualifying by the end of 2013. 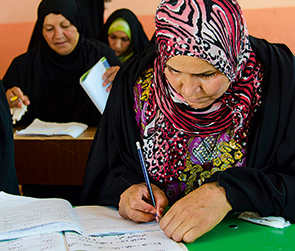 We opened dedicated training centres in Majnoon and Basrah in 2013, which offer a combination of classroom learning and on-the-job experience for Iraqi nationals. More than 8,500 training programmes took place in Basrah covering topics such as Shell’s Life-Saving rules and English language training. Road safety remains a key issue in Iraq and road traffic accidents are a leading cause of fatalities. We have a local programme to train drivers who work at Majnoon in techniques to stay safe. These include checking whether cars are roadworthy, planning journeys properly and driving defensively to avoid danger. More than 2,300 local drivers had taken this driving training by the end of 2013. We also continued to work with local contractors to increase performance on worker safety and align labour practices with Shell’s Supplier Principles. In 2013, we received support and recommendations on our contractor approach in Iraq from the Danish Institute for Human Rights. Near our Majnoon project, the improvement of access to basic services such as health and education is a constant challenge. People are often unable to travel to hospitals for medical care. We continued to support a mobile health-care programme, throughout 2013, working with the AMAR International Charitable Foundation and the Basrah Health Directorate. The programme provides health, education and training services to more than 9,000 people every month, including training for Iraqi doctors and health volunteers. A lack of adequately equipped schools hinders education opportunities for future generations. In 2013, we funded the refurbishment of three schools in the Al-Nashwa community near our Majnoon project: Shell upgraded one secondary school as well as two primary schools in partnership with the United Nations Development Programme (UNDP) Iraq. Our community development programme also supports vulnerable groups in the Majnoon area. For example, in early 2013, we launched a campaign to develop business skills and literacy among women in the community. Sport is a way to show young people how to work in teams and take on more responsibility. We support a youth sports programme, launched with the Football Club Barcelona Foundation and the Iraqi Ministry of Youth and Sports, for young people who live in the most deprived and conflict-prone areas in Basrah. Its aim is to instil social values through sport in children between the ages of eight and 17. We have a partnership with the UNDP to help implement and evaluate our community projects. In line with increased oil production, the amount of flaring of natural gas produced with oil at Majnoon increased during 2013. We expect gas flaring from these operations to rise in coming years as oil production increases. We are working with our joint-venture partners to evaluate options to capture the gas that is currently flared during operations for use in power generation. A memorandum of understanding has been agreed with the International Union for Conservation of Nature (IUCN) to help conserve biodiversity and manage the ecosystem at the Majnoon oil field. Working jointly with the Iraqi authorities, we will help conserve, restore and manage the Hawizeh Marsh, Iraq’s only wetland of international importance (see “Partners and collaboration”). Under the agreement, we intend to work together to build awareness and knowledge of the importance of the marshes and jointly find ways to reduce the impact of future development in this sensitive area.